Renovated in 2015, the accommodation is on the first floor of a village house. It offers two bedrooms and a large living room / kitchen area. Laroque-des-Arcs is the first village passing Cahors above Lot Valley. 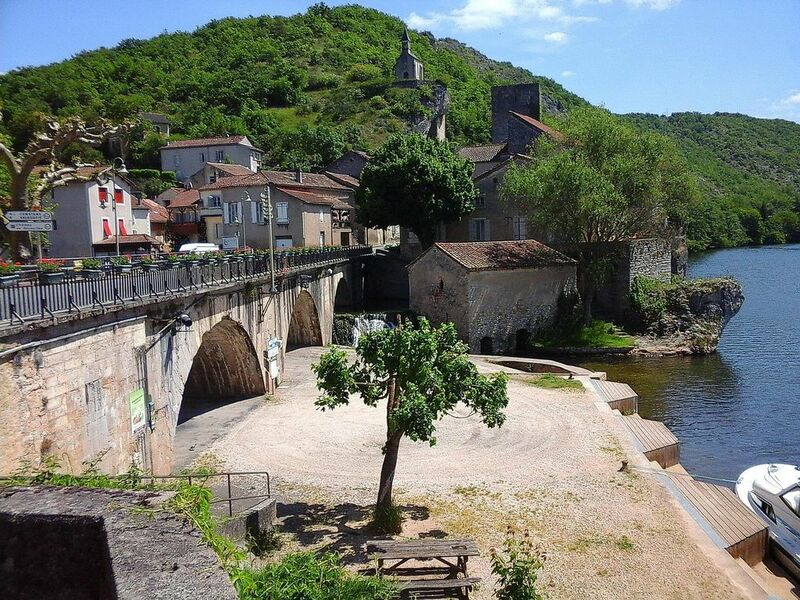 The location allows you easy access to the local remarkable places of interest: Saint-Cirq-Lapopie, Rocamadour, Padirac, Cahors vineyards, the Causse du Quercey (limestone plateau), etc. The village is at the centre of a navigable area. Boats depart from its port. Very short stroll to the river, ideal for fishing when there are no boats moored. Dog next door friendly, took him for a walk one morning. Good views from Chapel St Roch over the village and Lot valley, even better views if you walk to the top of the causse. Easy drive into town, plenty of free parking if you don't mind walking a bit, or use the free Park and Ride on the other side of the river - keep left and turn left over the first bridge and go towards the sports ground and swimming pool. If you use the underground car park off Rue St-Gery, look for the remains of the Roman Amphitheater. M Atger was waiting for us, his very first guests, when we arrived. He understands and speaks English, so long as you speak slowly and clearly, and he is amazingly helpful. The well-equipped apartment has a small but effective aircon unit which will cool the whole apartment if you close the windows and open the doors. If you visit in the cooler months, there are electric radiators. Early mornings are deliciously cool, the sun hotting up by mid-morning. So open the windows first thing, but remember to close them and the shutters before you go out. The kitchen has a microwave, small oven, hob, washing machine and fridge with a small freezer, and all you need in the way of plates, etc. The salon chairs are sooo comfortable and easy to get out of, too. The tv has all the main channels. There are plenty of towels and there is a good shower. The bedrooms are comfortable and give a view across to the river. The salon overlooks the square and houses, with their boxes full of plants and a beautiful spread of climbing plants over the balcony. You must greet BonHomme. He's the very friendly young dog at one of the opposite houses and he expects (and gets) greeted, and if you like dogs, he likes to be fussed. It’s easy to walk down to sit by the river in the evening. Take the slope down and walk under the bridge. It is beautiful there. It’s also lovely to stroll round the village in the early evening. There’s a small chapel (Chapel St Roch) on the hill above the village, and it’s worth the short walk to see it. There's a decent local shop just five minutes’ walk along the road. It sells most necessities. There's a boulangerie about five minutes’ drive (turn left as you drive off the square and it’s on the right side of the road) for your bread, and there's a very good fruit and veg market there, too. The nearest supermarket is Intermarché, easy to find, and about ten minutes away. M Atger will direct you. Nach einem Tag mussten wir leider den Urlaub aus familiären Gründen abbrechen. Wir sind sehr herzlich empfangen worden und fanden eine gut und modern eingerichtete Ferienwohnung in sehr sauberem Zustand vor. Uns war die Gegend bereits aus früheren Aufenthalten bekannt, von der Ferienwohnung aus findet sich in ca. 1 km ein Restaurant welches zur Mittagszeit geöffnet hat. Cahors ist nah gelegen und eignet sich für diverse Ausflüge. Unsere Abreise wurde mit sehr viel Verständnis aufgenommen und wir hoffen, später erneut Gast bei Atgers sein zu können. Nochmals vielen Dank auf diesem Weg. Accueil sympathique, appartement agréable prêt de Cahors. Les propriétaires sont très sympathiques. On a passé un bon séjour. L'appartement est très agréable et décoré avec goût. Le proprio est ébéniste, il a conçu tous les mobiliers lui même. Moderne et sympa. Route un peu passante à 50 mètres, mais rien de très gênant. Le cadre en bord de lot est agréable. Je conseille! Très bon séjour. Appartement très fonctionnel, très bien équipé, et très propre. Accueil très chaleureux et sympathique. L'appartement est proche de nombreux sites à visiter. La maison est très bien isolée, avec la canicule nous étions bien au frais. Joli petit village ce qui n'enlève rien. La route devant la maison est passante. Option ménage de fin de séjour 50€. Fourniture draps, 6€ par lit.